In the chemical industry, where aggressive and toxic media are often used, the advantages of non-invasive measuring technology are particularly appreciated. Oliver Foth reports. It's a long time since non-invasive flow measurement with clamp-on ultrasonic technology was known as an insider's tip. Flow measurement using the ultrasonic clamp-on method means: no wear and tear by the medium, no risk of leakages, no pressure loss and, above all, unlimited plant availability. Since ultrasonic transducers are simply attached to the outside of the pipe, no pipe work is required. When it comes to setting up a temporary flow measuring point, there is absolutely no alternative to clamp-on ultrasonic measurement - so much so, that experts are ready to make many a compromise in Ex-areas. 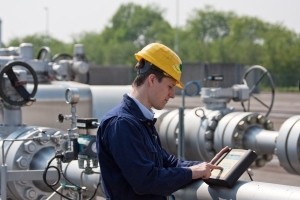 Those wanting to set up a flow measuring point in potentially hazardous areas during ongoing operation really do not have another alternative and must be prepared for paperwork and personnel costs. Since the revised version of explosion protection directives, there is no longer any portable ultrasonic flow measurement system that meets current ATEX standards. Plant operators have to make pragmatic use of special permits. Terms commonly used like 'hot work permit' or 'fire permit' certainly raise false expectations: there is hardly anything more boring than a day at work spent watching over two measuring devices, a flowmeter and a gas warning device. Unsatisfactory solutions with increased administrative and personnel costs are a thing of the past with FLEXIM's new FLUXUS F/G608. Technologically, the FLUXUS F/G608 is based on the platform of the versatile FLUXUS F/G601 which has been tried and tested a thousand times over, it is just as flexible and easy to handle and is certified for use in potentially explosive areas (Ex II3G). 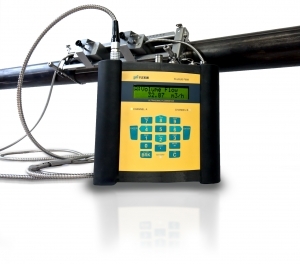 The FLUXUS F608 is used for non-invasive flow measurement of liquids and the FLUXUS G608 measures the flow of gases. Similar to all of FLEXIM's ultrasonic flowmeters, the new portable Ex devices also work according to the transit-time difference method. The acoustic transducers, which are mounted onto the pipe, send and receive ultrasonic signals which are irradiated into the pipe both with and against the direction of flow. The measuring transducer calculates the volume flow rate from the measured transit-time difference and the media and pipe parameters. Inherent to its functional principle, the acoustic measurement method works exactly the same in both flow directions and is therefore bidirectional. As with all FLEXIM flowmeters, the FLUXUS F/G608 also has exceptionally high measuring dynamics and is impressive both at very low volume flows and very high flow velocities due to its measuring accuracy. With the new FLUXUS F/G608, strict explosion protection requirements were met by using an intelligent design and modern materials. The ergonomically shaped housing of the measuring transducer is carbon fibre reinforced and ensures high impact protection. It is water and dust-proof (IP65), resistant to oils, many liquids and dirt. The new portable design shares the same efficient battery management of the FLUXUS F/G601 and guarantees over 14 hours of mains-independent measurement. Two pairs of transducers are enough to non-invasively measure the flow rate in the most common nominal width range from DN10 to DN2500 and there are other transducers for the nominal width range from DN10 to DN6500. The measuring transducer automatically recognises the transducers when they are connected and loads their calibration data. As a result, it is set up within minutes and incorrect parametrisations are avoided.